As we look over our calendar for the next two weeks, our tasks have taken on a new density. And the hours in which to accomplish them, like the shift from daylight savings to standard time, seem to have contracted. All that to say is that things are beginning to move very, very quickly. Amidst the impending chaos, we have a lot to celebrate - like getting our construction documents submitted to the city, which started last week - and kicking off November with our very first dance party (we love to dance, we love to party, come dance party with us). Oh, and remember our last update? The one where we mentioned mural-making? Well, here's your sneak-peek (you can also drive by the Carpenters Building and see it in person). Developed by Christopher Paul Jordan, COLORED is an experimental exhibition pairing the artworks and poems of Black creators from the US & Caribbean in dialogue across status, space, and time. Preview on 11/25 (Black Friday), opening event on 12/29. NEXT SATURDAY! The Dance Hall, a soulful collaboration between Alma Mater and The Art Dept. On November 5th we're staying home (at the Carpenters Building, that is) and dancing the night way with our friends,The Art Dept., Zodiac Supper Club, DJ Press Play, and all of you. Get your tickets here! The night before, on Friday the 4th, check out Phinisey, Nyoka, Mirrorgloss, and Madi Hope at Real Art. On Thursday, November 10th, Alma Mater will be presenting at the next Conversations Re:Tacoma 10x10 event. Bring your noisemakers and show us some love. Because we don't have time for a novel this month, and have been thinking in vignettes, short clips, and iambic pentameter, we've picked up Poetry's Old Air by Marianne Boruch. A book of essays, Poetry's Old Air explores how a poem is created, which we think has a lot of parallels with how our project has come to be. For the past year, we've had the honor to work on the design of the [new] Carpenters Building with the site-specific artists/architects of Lead Pencil Studio,Annie Han and Daniel Mihalyo. 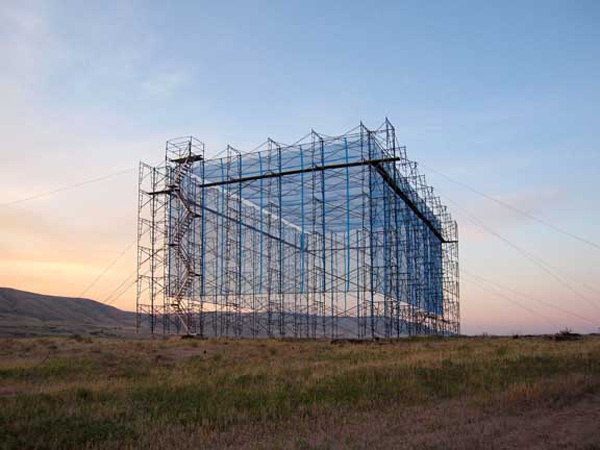 Some of their most recognizable works are Non Sign ii, a ghost-like steel "billboard" of negative space on the US-Canada border, andMaryhill Double (below), an architectural replica of the Maryhill museum on Oregon's Columbia River Gorge. More recently (and a little closer to home), they were participants in the Frye Museum's Genius/21 Century exhibition. See their interview on their commissioned piece for the show here. We are so happy to have their handiwork as part of a permanent structure in Tacoma, and can't wait to reveal their plans for the space in the near future.